NES The Adventures of Rocky and Bullwinkle and Friends (USA) in 03:54.16 by TASeditor. The Adventures of Rocky and Bullwinkle is an awful licensed game based on The Rocky and Bullwinkle Show. The game consists of five episodes (stages) of terribly bad side-scrolling platform action. Players can switch control on the fly to either Bullwinkle or Rocky and will have to do this as each character has their own unique abilities. 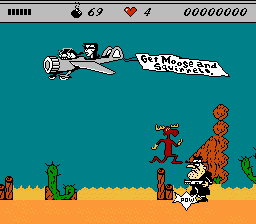 While both characters can jump and throw bombs, only Rocky possesses the ability to fly while Bullwinkle can charge enemies with his antlers. Both of these abilities sap energy for no reason. Luckily, TASeditor abuses a glitch in which holding Select sort of freezes the condition of the character, meaning it doesn't cost energy while going fast. Therefore, he reaches a time of just under 4 minutes.